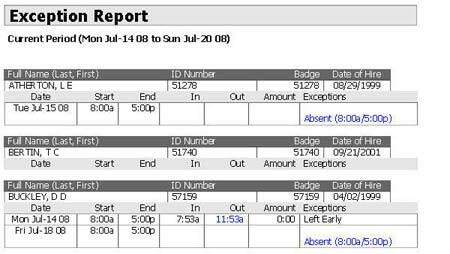 Attendance on Demand has over 20 predefined reports that help you track and analyze payroll report and labor data. But the real power is in creating your own reports. Report building blocks make it easy to choose basic formats, select fields, and choose how data is totaled. The Employee Exceptions Report displays employee exceptions for a selected period. The Actual vs. 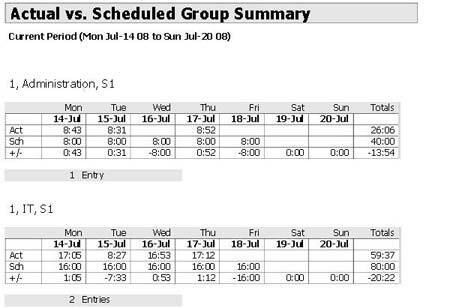 Scheduled Group Summary displays the actual hours worked in comparison with the scheduled hours, as well as the difference between the two. 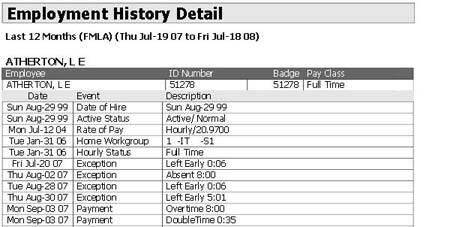 The Employement History Detail Report lists important employee events you select in chronological order. Automatically email reports upon completion. Display reports on the screen in PDF format. Save time by always having accurate and up-to-date information. Build report content by specifying workgroup levels, time periods, fields you want included and employees who meet a specific condition (such as employees without schedules today). Create commonly used reports shared by some users or all users. Generate private reports by user to ensure information security. Maintain private reports that only you can change and view. Run reports that an administrator or payroll manager has made available to you. Change report output for your convenience. All users can report only on employees whose data they are authorized to see.